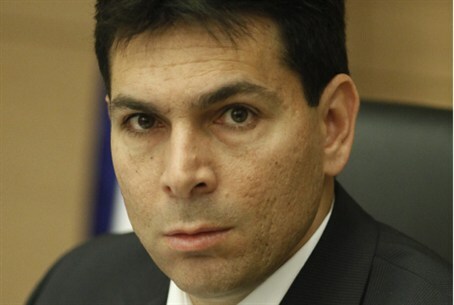 MainAll NewsMiddle EastDanny Danon: "Annul the Oslo Accords"
Danny Danon: "Annul the Oslo Accords"
In NYT op-ed, Likud MK and Deputy Defense Minister says "Two State Solution" is dead, calls for an alternative "Three State Solution." Israel's Deputy Defense Minister has called on the Israeli government to "annul the Oslo Accords," and adopt an alternative to the much-touted "Two State Solution" which would see the establishment of a Palestinian Arab state in Judea, Samaria and Gaza. In an op-ed for the New York Times, MK Danny Danon insists that, twenty years after the signing of the Accords between Israel and the Palestinian Authority, "The government of Israel must admit that we made a mistake and declare that the Oslo process has failed." It is a very public act of dissent by an Israeli minister, as Prime Minister Netanyahu's government continues to embark on negotiations with the Palestinian Authority within the "Two-State Solution" paradigm. But Danon - who is not only a government minister, but a member of the same party as the PM - points to the fact that the rate of Israelis killed by Arab terrorists increased significantly following the Oslo Accords and subsequent Israeli concessions to the PA, suggesting that such a "paradigm" merely exacerbates the conflict as opposed to providing a viable solution to it. Danon insists that the failure of Oslo is not due to a lack of Israeli efforts to reach a peace deal, citing numerous Israeli initiatives and concessions - including the deportation of thousands of Jewish civilians and the destruction of Israeli communities - none of which resulted in peace. Instead, he says, it is the PA's refusal to accept the existence of the State of Israel as a permanent reality which has prevented peace. He calls upon all parties involved, including the international community, to "rethink the existing paradigm and hopefully lay the foundations for a more realistic modus vivendi between the Jews and Arabs of this region." "In the short term, the Palestinians will continue to have autonomy over their civilian lives while Israel remains in charge of security throughout Judea and Samaria, commonly referred to as the West Bank. Following an initial period, the Arab residents of Judea and Samaria could continue to develop their society as part of an agreement involving Israel and Jordan. Similarly, Gaza residents could work with Israel and Egypt to create a society that granted them full civil authority over their lives in a manner that was acceptable to all sides." The hawkish Likud MK has never been shy of controversy, or of publicly opposing policies by his own ruling party and the very government in which he serves as a deputy minister. Only a week ago, he was reportedly reprimanded by the Prime Minister for rejecting the idea of an "interim" Palestinian Arab state in Judea and Samaria, and for calling for the expulsion from the Likud party of any member who supported such a move. The "Two-State Solution" paradigm, initiated by the Oslo Accords, has come under repeated criticism in recent months, amid feelings that a stubborn insistence on sticking to the same failed formula has served to prolong and even exacerbate the Arab-Israeli conflict. Last month, an unprecedented Jerusalem conference on the topic saw a range of speakers - including Israeli academics, politicians and a Palestinian Arab activist - call for a renewed debate over the concept of "two states for two peoples," and rejecting the Oslo process as "dangerous" and "unrealistic."